Selecting an excellent pair of running shoes takes time. However, most runners don’t take as much time trying on different shoes as they need to and don’t understand what type of shoes are best for their feet. They also often forget to bring their orthotics along with them when trying on shoes. Finding a good pair of running shoes requires research and time commitment, as shoes are crucially important to push through mile after mile. An improper fitting shoe could contribute to injury, while a properly fitting shoe could help you remain injury free. At Ravenswood Chiropractic, we see many cases of improperly fitting shoes that are a contributing factor of recurring injuries. There many different types of shoes on the market, but if you are a beginner or haven’t put much thought into trying to find the perfect pair, continue reading to discover how to select the best running shoes. What Type of Shoe Should I Get? If you are not sure what running style is yours, you can identify it by looking at the wear pattern on the sole of your shoes or Dr. Renn will be able to tell you for sure. While pronation is necessary during running, over-pronation is marked by wear along the inside edge of your shoe. 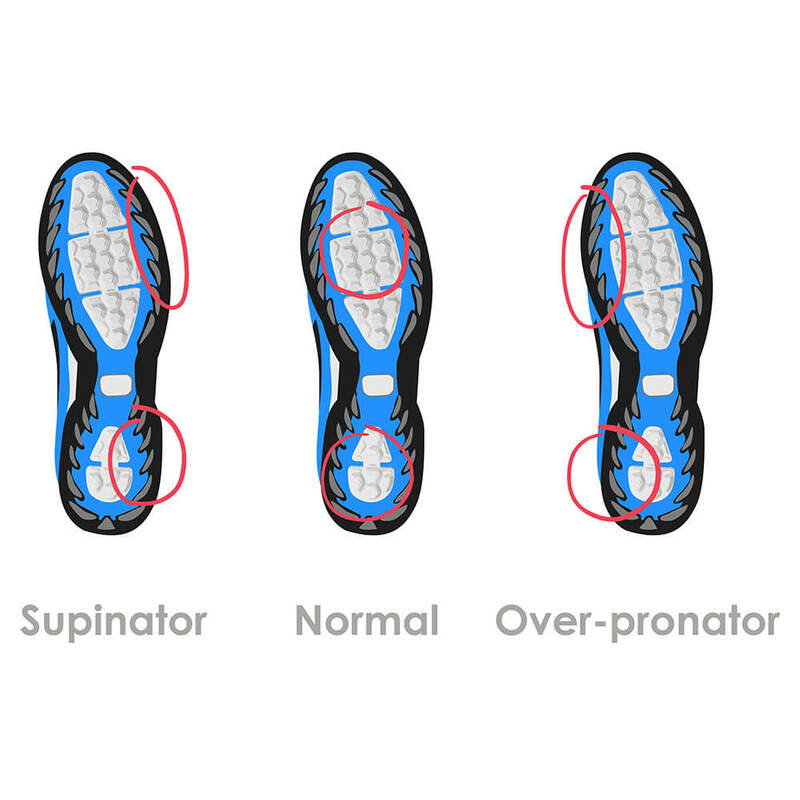 Supination is seen by wear along the outer edge of your shoe. Over-pronation should be and can be easily corrected by a trained healthcare provider who specializes in body mechanics such as Dr. Renn. Correction can include strengthening the area with physical therapy or in more severe cases custom orthotics. It is important to see someone specially trained as trying to compensate for it with a specialty shoe or store bought orthotics may lead to other problems like knee pain in the future. ALL runners should opt for a neutral shoe whether or not you are a neutral, an over-pronator or a supinator runner. No matter how good the running shoe is at correcting faulty foot biomechanics – it cannot do it as precisely and efficiently as a custom-made orthotic that is specific to your foot, molded to your foot, and manufactured for your specific weight and activity. Look for neutral shoes that have a minimal or no heel to toe drop (6mm or less). Anything more interferes with the normal functioning of your gait cycle. All running shoes should be lightweight – less than 10 oz and have minimal cushioning. Tip: If your feet are different sizes, then buy different size shoes. Remember that the way you walk is different than the way you run so don’t depend on advice from salespeople who make recommendations based on watching you walk around the store. Where Are You Going To Be Running? On The Track or Road? People who are running on a track or the road should search for light, flexible shoes that have plenty of cushions and can stabilize your feet stride after stride. Tip: Even with shoes that offer plenty of shock absorption, running on the road is not natural and will take its toll on the body over time. Ideally, switch up running on the road with running on trails from time to time. When running on trails, search for shoes that are stable, offer plenty of traction, sturdy support, and provide underfoot protection. When running cross country style like this, expect to step on rocks and other objects, which makes it important to have plenty of protection and foot stability. While it may be extreme for many people, some are turning to running barefoot or using minimalist shoes to reduce injuries. In fact, Abebe Bikila, the winner of the 1960 Olympic marathon, ran it barefoot so it can be done! To mimic running barefoot, some people are turning to minimalist shoes, completely changing their stride back to the way we are naturally designed to run. Individuals who are having problems with typical running shoes may want to consider this option, as it might be the perfect solution for them. If you are interested in trying to run barefoot, always start slowly, then gradually increase the distance and time so your feet can adjust to it. Look for shoes that are designed to fit your feet, with individual toe slots. These shoes should be thin and abrasion-resistant. Some minimalist shoes to consider are the Vibram FiveFingers. How Snug Should My Running Shoes Be? To avoid your toenails jamming against your shoe, make sure you have a thumbnail’s length of extra space. The width of your shoe should be snug enough where there is still room for your foot to move around without rubbing. You should be able to wiggle your toes comfortably. If you take the insert out and step on it and your foot hangs over the edge, then the shoe you are looking at is likely too narrow. Another factor to consider is your shoelaces. They should be snug, but not tight. Check out our guide for some lacing tips! Remember when trying on your shoes, Wear your orthotics! Orthotics change the shape of your feet and how your shoes fit. If you don’t have your orthotics with you, come back another day. Also, your feet swell with activity, so it is best to try on shoes after a run or at the end of the day so you can be certain you’ll have the right fit throughout your training from beginning to end. We recommend our runners to switch out running shoes every 300 to 500 miles or 3 to 4 months. If there is uneven wear on the soles, you will need to replace them sooner as this can lead to injury. Since nagging injuries often result from wearing the wrong type of running shoes, anyone who is having problems or simply looking to remain injury free can find the best fitting shoes for their feet and in some cases, opt for minimalist shoes or barefoot running. If you have foot or ankle pain, schedule an appointment with our SFMA certified chiropractic physician today and don’t forget to bring your running shoes with you!